Includes newly discovered American dragons! Fans of Graeme Base-and dragon lovers-will be thrilled to discover this brand-new edition of the classic book of serpentology, The Discovery of Dragons, first published in 1996. 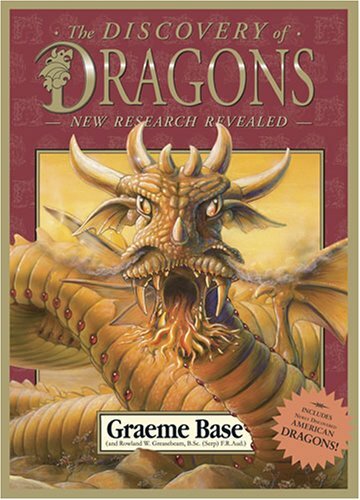 Now it includes a special section on "New World" dragons, before now unknown. Was Bjorn of Bromme one of the greatest explorers of the Viking Age or just a simple-minded, lice-infested barbarian with a passion for beach volleyball? Could Soong Mei Ying, a thirteenth-century teenager, really have discovered the Asiatic dragons or did she just need a good excuse to leave home? Did Dr. E. F. Liebermann perish after discovering the Common Green Draak, also known as the "Awful Gurgler," or was he suffering from a severe bout of jungle madness? And does Francisco de Nuevo still live today, working as an extra on Canadian television, after discovering the secret of eternal youth in 1532? "Astute readers will note that there have been absolutely no changes made to the original text of the book. This is due to the fact that it was completely perfect in every way. However, those same readers will be delighted and amazed by the addition of a brand-new chapter introducing a previously uncatalogued class of Dragons: the New World Dragons. About Graeme Base (Author) : Graeme Base is a published author and an illustrator of children's books. Some of the published credits of Graeme Base include Animalia, Enigma: A Magical Mystery, The Water Hole, and Jungle Drums.